Hurl Taylor first experienced prison ministry in Heidelberg, Germany, at the end of an impressive 20-year career in the U.S. Army. He served as president of an Army organization called Protestant Men of the Chapel, a group that traveled regularly to German prisons housing English speakers. Fast forward three decades and a second successful career as a lawyer: Taylor, now 77, will graduate May 9 in the first class of students to earn Candler School of Theology’s newest degree, the Master of Religion and Public Life (MRPL). 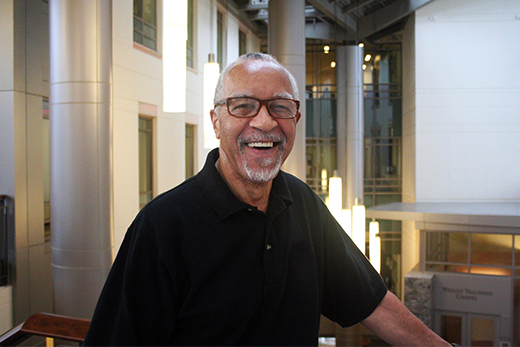 It will be his second Emory Commencement, after earning his law degree here in 1985, and he will be the oldest graduate in the Class of 2016. Candler's MRPL degree struck Taylor as the perfect way to help expand the calling that has been percolating since his days in Germany: providing Christian education to incarcerated youth. The program is geared toward lay people — those not pursuing ordination in a faith denomination — seeking theological training to enhance their effectiveness in professional or volunteer arenas. Taylor’s work with juvenile offenders dates back to his years in criminal law. Now, as a member of the prison ministry team at Beulah Missionary Baptist Church in Decatur, he ventures behind the bars. The group makes weekly visits to the DeKalb Regional Youth Detention Center. If an ordained minister comes along, they’ll hold a full worship service; if not, lay members will lead prayer, singing and have a lesson. “That’s where I come in,” Taylor says. The military, the courtroom, and a one-year stint as a high school biology teacher have prepared Taylor well for engaging his audience, a group of four to 20 boys ranging in age from 12 to 16. He starts by emphasizing that he and the other volunteers are not there to criticize them. “We say, ‘We’re from the church, but we’re not judging you.’ We don’t ask them what they did," he explains. Taylor opens with an icebreaker, getting the boys talking about current events or favorite sports teams. He’ll then introduce a scenario —sometimes from the Bible, sometimes not — and ask them to respond. “I frequently share real life experiences, because coming up, I could have been in juvenile court," he says. "I escaped, partly because my grandmother and mom were good disciplinarians. But I tell them about those things. We’re all human. Some of his favorites: Ellen Ott Marshall’s Voices of Nonviolence, Elizabeth Bounds’ Christian Ethics, Robert Franklin’s Public Intellectuals, and Daily Life in Ancient Israel with Emory College Professor Oded Barowski. “A lot of this I didn’t know, and I can’t wait to pass it on to these young men, and hopefully young ladies, in the future," Taylor says. Bringing his lessons to female incarcerated youth is one of Taylor’s primary goals as he considers life after Candler. He’s also working to develop a standardized curriculum that has built-in flexibility — a challenging task. “The youth are transient, so we may not get the same people every time. We can’t start with Genesis and go straight to Revelation,” he explains. Taylor believes his new Candler connections can help him achieve these aims. “I’ve made friends and contacts, so I’ll be able to draw from other people and programs here.” And knowledge of Candler’s partner organizations around Atlanta will provide ways for him to help juveniles plug in when they reenter society. Wise words from one who has used his many life experiences to help others — and who will soon receive his second Emory degree. “When I get all my papers written, then the day after Mother’s Day, I’ll put on my gown and my fancy hat and we’ll hear the Pomp and Circumstance," Taylor says.